Every day in Washington, DC, the blue-and-gold 1st Helicopter Squadron, codenamed MUSSEL, flies over the Potomac River. As obvious as the presidential motorcade, most people assume the squadron is a travel perk for VIPs. They're only half right: While the helicopters do provide transport, the unit exists to evacuate high-ranking officials in the event of a terrorist or nuclear attack on the capital. In the event of an attack, select officials would be whisked by helicopters to a ring of secret bunkers around Washington, even as ordinary citizens were left to fend for themselves. For 60 years the US government has been developing secret doomsday plans to protect itself, and the multibillion-dollar Continuity of Government (COG) program takes numerous forms - from its plans to evacuate the Liberty Bell from Philadelphia to the plans to launch nuclear missiles from a Boeing-747 jet flying high over Nebraska. 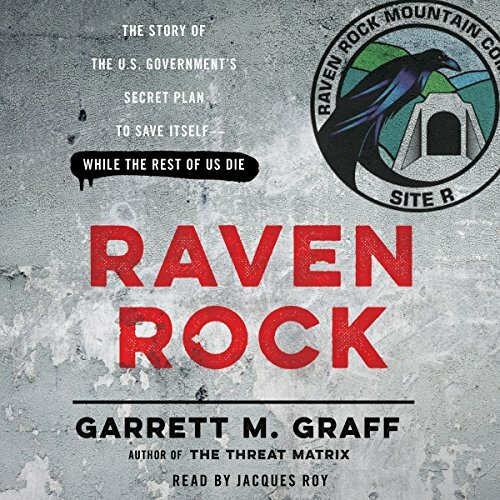 In Raven Rock, Garrett M. Graff sheds light on the inner workings of the 650-acre compound (called Raven Rock) just miles from Camp David as well as dozens of other bunkers the government built for its top leaders during the Cold War, from the White House lawn to Cheyenne Mountain in Colorado to Palm Beach, Florida, and the secret plans that would have kicked in after a Cold War nuclear attack to round up foreigners and dissidents and nationalize industries. Equal parts presidential, military, and cultural history, Raven Rock tracks the evolution of the government plan and the threats of global war from the dawn of the nuclear era through the War on Terror. I'm a huge nerd when it comes to Cold War History & have listened to literally everything sold by audible.com on the subject. This is definitely my new favorite (Command & Control would be a close second). Can't recommend it highly enough! Fascinating post-WWII history of the US Continuity of Government (COG) plan. COG will try to protect a few thousand select members of the Government and the private sector. The rest of us are on our own. Is anyone aware of a Reform ("Calvinist") sect of the Amish community that might accept me and my family? Fascinatibg story well told and beautifully read. Jacques Roy's reading is subtle and clear and very easy on the ear. Garrett Graff elegantly unveils the history and current state of this hitherto obscure piece of US governance. Extremely informative and interesting. Personally, even growing up in the Cold War, I was unaware of almost all of this. While the book is great, the narrator speaks in a hushed monotone that makes you want to take a nap. the only thing for me was the narrator. Almost makes you want to sleep on such an amazing historic events.After this book I am not as afraid of EMP ATTACKS as I used to be but horrified by federal and state government stupidity even after all that taxpayer money funneled in defense contractors. Gives a real nice insight into presidencies from FDR to OBAMA. this book is very interesting lots of things I have never heard before . I really enjoyed this book from a historical perspective. You really get to see how major events such as Pearl Harbor, Hiroshima, FDR dying, Kennedy assassination, the Regan shooting, 9/11 and so many more historical events shaped this nation's Continuity of Government planning. Truly a fascinating and thorough analysis of what our government has done to plan for the worst and in some cases such as 9/11 not done to plan. This book truly left me wondering what else is out there that the general public has no knowledge of. This was a great behind the scenes look at our government. Very insightful and disturbing at the same time. I would definitely recommend this book as a must read. State and local emergency management personal who are required to do contingency planing will benefit from this book . I am a retired emergency management directory of a small rural county with over 30 years of experience and I learned a lot from this book. I looking forward to your next research project. The story, performance, and overall came together very nicely. Extremely detailed book on our government. Amazing detail on hidden facilities you never knew existed. One note about the author, he is a left leaning guy, check his tweets. I'm thinking about listening to it again, it's that good.